Today: Resist the urge to dress this cake up -- it's perfect just the way it is. I saw my future in this cake, and in my future, I was an overbearing stage mom with lipstick on my teeth. I longed to dress my cake in ribbons and frills and make it presentable to guests. In cake-speak, this meant that I was itching to overload it with roasted fruit, to flood it with spice-infused cream, to make it a debutante. But this cake wanted to be free. It wanted to sleep in late on Christmas morning, to go out sledding, to romp around in the snow, and to track water through the house. It was comfortable in its tomboy-ish ways, content with its gruff manners and its laidback attitude. Just as I started spouting off ideas for how to dress up the cake like I had a verbal tic, the other editors put me in creative handcuffs. The beauty of this cake, they reminded me, lies in its simplicity, and everything I was piling on top of it was just a distraction. More: If you do want a cake that's gussied up for the holidays, look no further. This is a two-bowl, all-of-the-ingredients-are-already-in-your-pantry sort of cake. It belongs on your post-holiday brunch table -- and not only because you can make it at 8 A.M. on December 26. Throw together the batter when you realize you spent so much time fussing over the capital H, capital M Holiday Meals that you forgot about feeding your guests the next day. It will slow your mind -- anxious from dolling up pretty candies -- and your body -- strung-out from digesting sugary treat after sugary treat -- but it's not so virtuous as to be annoying. This cake, in fact, is part of the series called "Food That Tastes Better Drowned with Cream" (food 1: Swamp Pie; food 2: Kale Gratin). You'll make a quick cornmeal batter, dump it into a cast-iron skillet, then pour a cup of heavy cream over the center (and no, you cannot substitute skim milk). As the cake bakes, the cream will form milky rivulets all over its top. 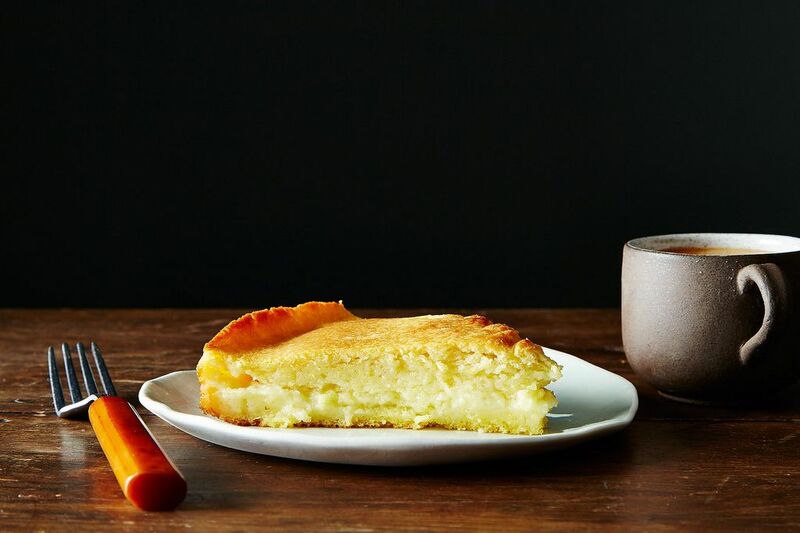 The real surprise comes, however, after you cut out a wedge: The cream sinks, forming a custardy middle layer below the crunchy cornbread top and above the firm bottom. A grainy, slightly sweet pudding with just enough flour to call itself a cake: It's a Christmas (or a post-Christmas) miracle. Even when I tried as hard as I could to let this cake be, I couldn't resist ladling a little maple syrup over top. And you can do the same if you'd like. But come on: You've just spent the weeks from Thanksgiving to Christmas fancying up your desserts. Now it's time to give yourself a break. Put on some wooly socks and let this recipe be exactly how it is. It's not only good enough -- it's great. I made this, this morning, It is simple and delicious. Thank you. Has anyone done this GLUTEN FREE? If so which ALL PURPOSE FLOUR did you use and how did it come out? THANK YOU! 350 degrees, not 250! This won't let me edit my posted comments. Shanya, if you preheat the skillet in advance, this will properly cook the bottom so it isn't soggy and it won't stick. 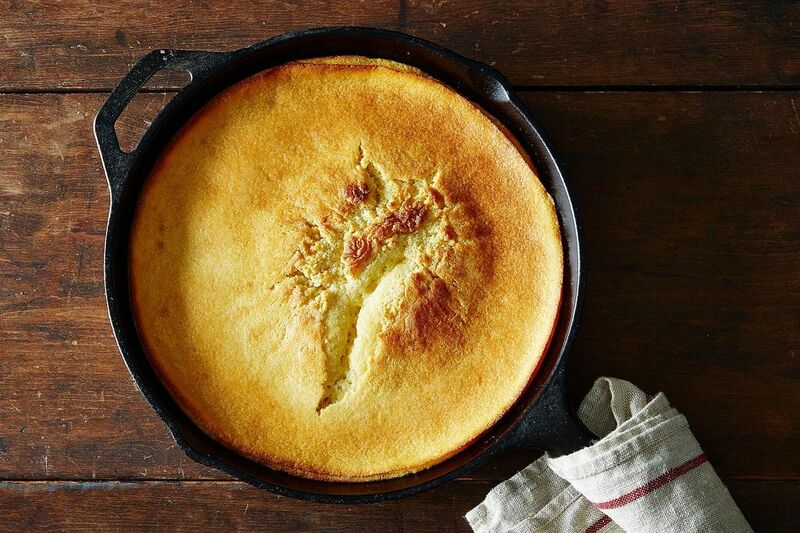 Just as with regular cornbread, it's best to place the dry skillet in the oven and preheat the oven and the pan at the same time. When the oven reaches 250 degrees, melt the butter in the pan, spreading it around with a fork or spatula. Be sure to spread the butter along the sides as well as the bottom, as it melts. When the butter has melted, pour the batter into the pan, then pour the cream into the center. The hot pan will properly cook the underside of the cake. The result will be a bottom layer that is fluffy and moist all the way to the bottom; but it's not soggy. And it doesn't stick! Just made this cake and it's great! I am wondering if anyone else had a problem with a soggy bottom, and what I could do to correct it. Preheat the skillet in the oven? The top was golden and perfect, cooked in an 11" cast iron skillet. Would this work with flax or chia seeds to replace the eggs since I want to make it vegetarian? I just made a similar cake with berries. It's great with fruit, but still plain enough that it doesn't feel gussied up. I just took my regular sweet cornbread recipe though and added the cream. . . This is a great cake! It is best served right from the oven and eaten the day it is made. My Mom always made this when we were growing up in VT. We would put plenty of butter on top.... She calls it Spider Johnny Cake. Back then, we didn't know that a 'spider' was a skillet with legs, so it could be cooked in the fire. I think cast iron makes a big difference, but it could just be sentimental for me. I'm sure this is yummy - it has to be worthy with so many steps to prepare! I would like to try this sans nutmeg (or maybe less nutmeg), any suggestions? Prior comment was not meant for cornbread cake- sorry! I don't have an cast iron skillet. Can I use a regular baking dish? Don't need one. I use a large skillet that has an oven-proof handle. I am looking for a cornbread to serve with beans, but it can NOT be crumbly, or my husband won't eat it-and this definitely doesn't look crumbly! So what I'm wondering is, instead of pouring the cream over the top, if I mixed it in with the other ingredients, would it make for an overall non-crumbly cornbread that could be served with butter on the top? Marcy, I once googled "Sweet, moist cornbread" because I dislike dry,, non-sweet, crumby cornbread. Anyway, up popped a great recipe that I have made countless times and gotten undeserved credit for. It calls for Albers cornmeal, but any brand will do. Nothing exotic in the ingredients and it is great with a meal or as a dessert or with breakfast. If you want a moist cornbread Google cornbread made with jiffy corn muffin mix, sour cream, cream corn, and oil. Wonderful. The best. Beat eggs. Mix all other ingredients together, then combine with eggs. Put into a well greased 8” square pan. Bake at 350 degrees until brown at edges, 30-40 minutes. Cooking time will vary from oven to oven so check at 30 minutes. May take as long as 45 minutes. Recipe can be doubled easily. This Jiffy mix, is about as bad as you can get, forget the"Jiffy Mix" try someother mix!!! !